As a school district that has implemented a 1:1 initiative where every student is provided an iPad, we get frequent inquiries from other communities looking to begin similar programs. Back in 2011-2012 school year as our 1:1 Planning Team began the process of setting the stage for year one of this initiative, we had more questions than answers. Interestingly, each school district that we speak with regarding our 1:1 journey has many of the same questions. With this in mind, I thought it would be worthwhile to share some of these common questions and our responses to them. However, before answering these questions, it needs to be noted that there is no one right answer to many of these questions. These questions need to be answered by the stakeholders in your community because the final solution for our schools is not necessarily the final solution for another school or district. In addition, some of these questions will need to be revisited given the ever-changing nature of technology. Finally, I am sure that I missed a lot of questions so feel free to drop new questions or follow-ups in the comment section. In regards to the final device choice, I would suggest something that meets the needs of all learners and can support your instructional goals. While you will never be able to choose one device that would be the first choice for everyone, you will be able to choose a device that will allow everyone to get their work done. Your technology of choice should be integrated to support your current objectives. How do you control students getting distracted by all the websites they love to visit while they are avoiding the work at hand? This is an important conversation that should be had frequently in the early months of 1:1 within and across departments. The more we discuss this, the clearer it becomes is that the best way for teachers to monitor student activities in their classrooms has not changed due to the arrival of more devices in the hands of students. The key is for staff to be active moving around the classroom and use what one colleague calls “the two legs app.” Students have always been distracted and always will, but we need to talk about classroom best practices that can help us in minimizing these distractions. Do you find that students are more excited about learning? We have seen an increase in the levels of classroom engagement, but this is more do to changes in instructional practices than the addition of technology to the classrooms. Even prior to the arrival of the iPads in our district, we had started Learning Walks to look at the level of student engagement in our classroom. We have found that the level of engagement is higher due to the numerous digital resources that are available to staff and students which allow a greater variety of methods for students to show their learning. What are some examples of collaboration you have seen happening in your district that otherwise would not have happened without the 1:1 technology? Some of the examples of technological resources that have helped us increase collaboration between staff and our stakeholders are our district blogs which have grown to over 100 across the districts. Knowing that their students all have web-enabled devices in their hands, teachers have taken advantage of using online spaces such as blogs and web pages to post assignments, videos, and other instructional resources. In addition, we have numerous social media accounts at both the school and district level which allow opportunities for collaboration. Our use of Google apps, particularly Google Drive and Google Docs has created an increase in collaborative writing and collaboration in general due to the ability of staff and students to connect both synchronously and asynchronously to complete tasks. Do you have a fee/rental fee/lease fee/pay to own for the use of the technology? We do not have a fee, but we do have students and parents sign a responsibility form and we recommend insurance. Do they own the iPad/laptop when they are finished with high school? Upon graduation, students have the option of purchasing the iPad. The vast majority of our students take their iPads with them. What happens if a computer is damaged/breaks? If it is the students fault are they responsible for paying the replacement cost of the laptop/iPad? Insurance covers loss, theft, and damage to the iPads, but if a family does not have the insurance then they need to cover the cost of the repair or replacement. Do the students bring the laptop/iPad home with them for use at home? Students at the high school bring their devices home and we are looking at a plan for students at other levels to bring their devices home as well. 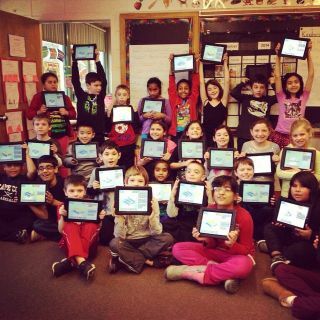 The use of tools like Google Apps for education allows students to access their work on any device to which they have access which minimizes the impact of students across the district who only have access to iPads in school. Do the parents/guardians sign an agreement policy for the use of the iPad/Laptop? Does the technology department keep the computer/iPad over the summer months to clean the computer and download new software? High school students are allowed to bring their devices home during the summer while iPads in grades K-8 are kept at school. Did your district start with all student getting the technology or did the district start with a certain grade level? The 1:1 initiative began at the high school in 2011-2012 and expanded to the middle school in 20012-2013. In addition, we began a pilot in a single classroom in grades 1, 4, and 5 at each of our four elementary schools in 20012-2013. The teachers for these pilots were chosen due to their high-level of interest in Started at the high school. Then we went to the Middle School and had pilots in the elementary. How did you fund your 1:1 plan? School budget, capital expense, grants, donations? When you went 1:1, did you simultaneously make any changes to your textbook purchases, in terms of electronic subscriptions or plans? How did those changes affect your budgeting (i.e. how much did it add per device purchased)? If your rollout was one grade per year, how did you handle textbook changes for cross-grade courses? When we went 1:1, we made a commitment to not buying any new sets of textbooks and instead commit time for teacher to build own resources. The process of staff developing their own resources continues to be an ongoing process. With the growing number of Open Educational Resources available as well as tools for teachers (and students) to create their own “books” to move beyond the traditional textbook, time and training are the only hurdles that need to be cleared. Were there any bulk purchases for e-books for the school library with the 1:1 initiative? If so, how were they funded? What was your planning and timeframe for professional development with the 1:1 plan? We spent a year ahead looking at digital resources that could help add value for teachers and students. This type of PD has been ongoing and embedded with the support of building and district-wide Instructional Technology support. Our Student Help Desk has also played a huge role in our ongoing learning in regards to utilizing digital tools. The BHS Help Desk provides support daily for staff and students who need help with their device or would like to know how they can use a specific digital tool to support their learning. During the first year, we simply asked that all teachers consider using a digital space to share work with students and then provided time for teachers to share what was working best for them. Now in year four, we have added a district-wide Mobile Learning Coach to support building-based Instructional Technology Staff. My recommendation for schools and districts who would like to move forward is to commit to spending 20-25% of what you spend on “the stuff” to Professional Development in the form of training or staff to support classroom teachers. What additional technology infrastructure/staffing did you need for the Tech Team and the school network to successfully host/manage so many additional wireless devices? The network was in place first. I regards to staffing, there has been no significant change to the IT Staff that handles our network and hardware issues. We did add a Director of Technology Integration and a Mobile Learning Coach. Chromebooks, ipads or laptops, which one and why? I would say iPads or Chromebooks from a cost and management standpoint. You can decide which makes sense for you based on the types of tasks you expect students to be completing in their daily routines. This is a conversation that needs to take place locally and with the appropriate commitment to Professional Development I do not think that there is a wrong choice. Which grade do you begin with 9, 10, 11 or 12? Does grade 12 even make sense? Again, what are you goals with the program? Are there grade levels where you feel the capacity of staff is stronger in regards to implementation. Starting smaller where you are confident there will be success makes the most sense. The important things is that no matter where you start your 1:1 journey, there needs to be regular updates for staff, students, and the community to share successes, challenges and plans for further expansion the program.